Protection of critical infrastructure and the resolution of conflicts in Europe top the agenda. During the presidency of Ukraine in the UN Security Council in February, the Ukrainian delegation will suggest two topics for discussion: protection of critical infrastructure and conflict settlement in Europe. Both topics are expected to be discussed along with the broad participation of representatives of the EU, OSCE, IAEA and other international organizations. 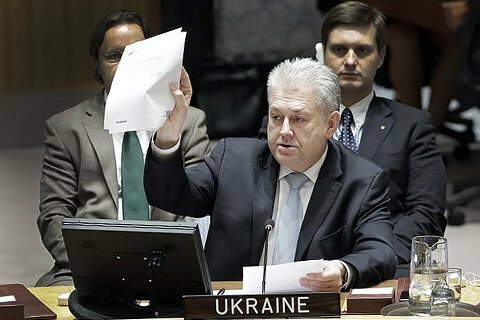 In an exclusive interview with LB.ua, the Permanent Representative of Ukraine to the United Nations Volodymyr Yelchenko said the protection of critical infrastructure is planned to be considered on 13 February. "The world is so technological that we do not even imagine what it means to turn off the electricity, for example, in a city like New York. It is much harder and dangerous than simply no light in the apartments. Even more so considering the current terrorist threats. In fact, this is one of the segments of the much talked about hybrid wars. Of course, this topic is very relevant for Ukraine but it is no less relevant for many other countries," said Yelchenko. He said experts have been invited to participate in these discussions. Firstly, those are representatives of international organizations, in particular, dealing with threats in the relevant sectors of the economy like the OPCW (Organization for the Prohibition of Chemical Weapons), the International Maritime Organization, Interpol, etc. Secondly, independent experts, eg the former IAEA Deputy Director General Olli Heinonen. The debates are expected to be followed by the adoption of the special resolution. The second topic that Ukraine will suggest for discussion is the settlement of conflicts in Europe, proposed for consideration by February 21. "Oddly enough, the UN Security Council has not discussed this issue for 20 years now. Last time it was raised in about the same format was during the wars in the Balkans, in the midst of the post-Yugoslav conflicts in mid-90s," he said. Yelchenko said Ukraine wants this debate to show whether the mechanisms for resolving conflicts in Europe are working or not. "For us, it is important in the context of the situation in Donbas because that a European conflict that carries potential threats of both European and global scale, and it is very far from settlement. Other countries, including almost all EU member states take a huge interest in the subject because European security is not just [a prerogative of] NATO. Also, will have the opportunity to raise the issue of the so-called "frozen" conflicts," said Yelchenko. He said that EU High Representative for the Common Foreign and Security Policy F. Mogherini, OSCE Chairman, Minister of Foreign Affairs of Austria S. Kurz and OSCE Secretary General L. Zannier have been invited to participate in debates. There may be more representatives from other European organizations, GUAM etc.